AMD is launching their latest Radeon HD 7990 “Malta” GPU next month and the first performance benchmarks have already hit the web. 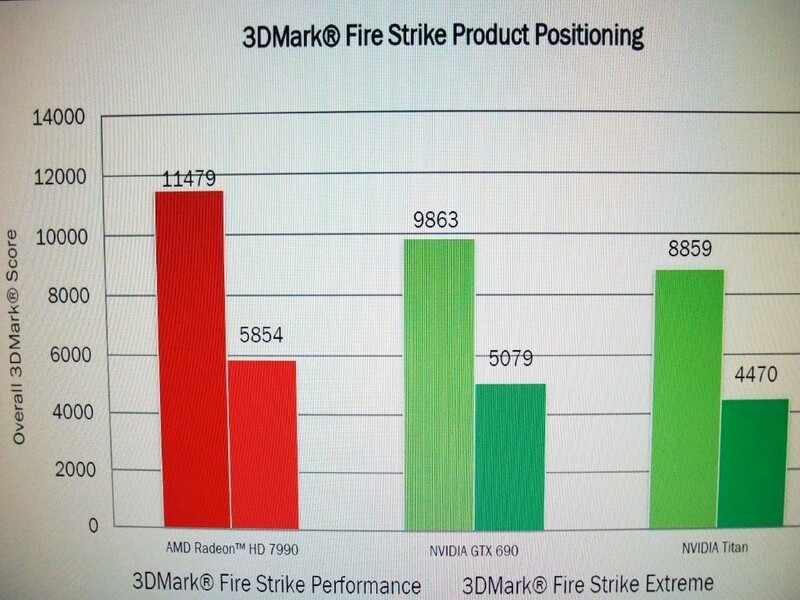 The benchmarks leaked compares the upcoming GPU against the GeForce GTX Titan and the GeForce GTX 690, both of which cost $1000 US similar to the Radeon HD 7990’s price point. As far as specification are concerned. The AMD Radeon HD 7990 “Malta” has two Tahiti XT cores which result in a total of 8.6 Billion transistors, 4096 Stream processors, 2 Prim /Clock , 256 Texture mapping units and 64 Raster operating units. 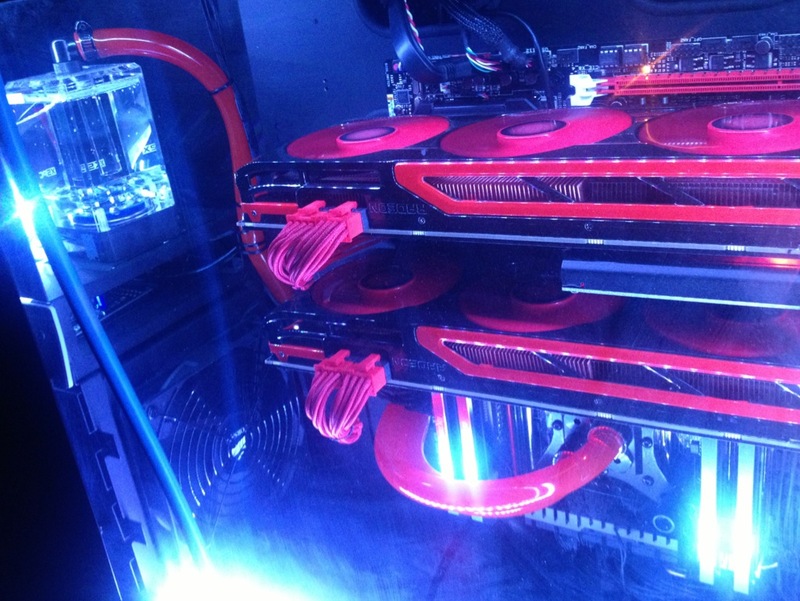 The core is clocked at 1000 MHz or 1 GHz though not known whether it has the GPU boost technology enabled or not. 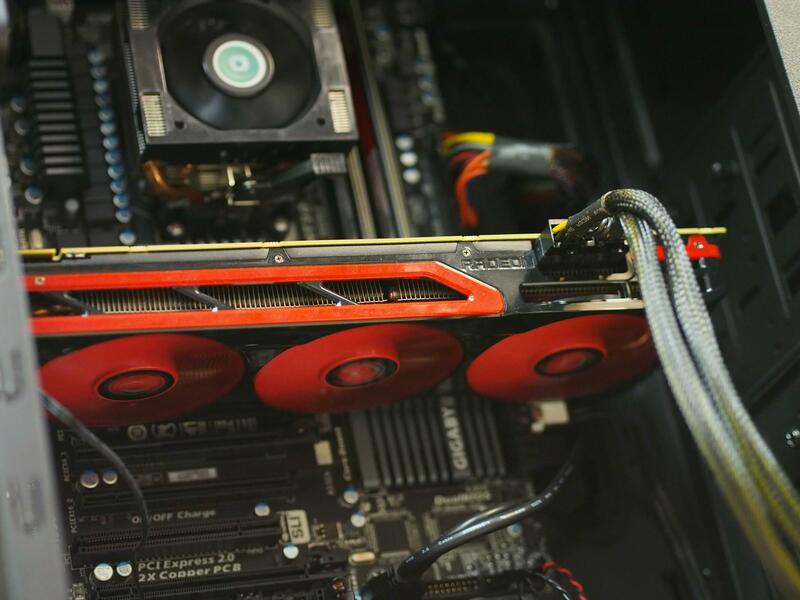 The card is equipped with a massive 6 GB GDDR5 memory that operates along a 384-bit x 2 memory interface and is clocked at 6.0 GB/s effective frequency. The memory pump outs an impressive 576.0 GB/s bandwidth. 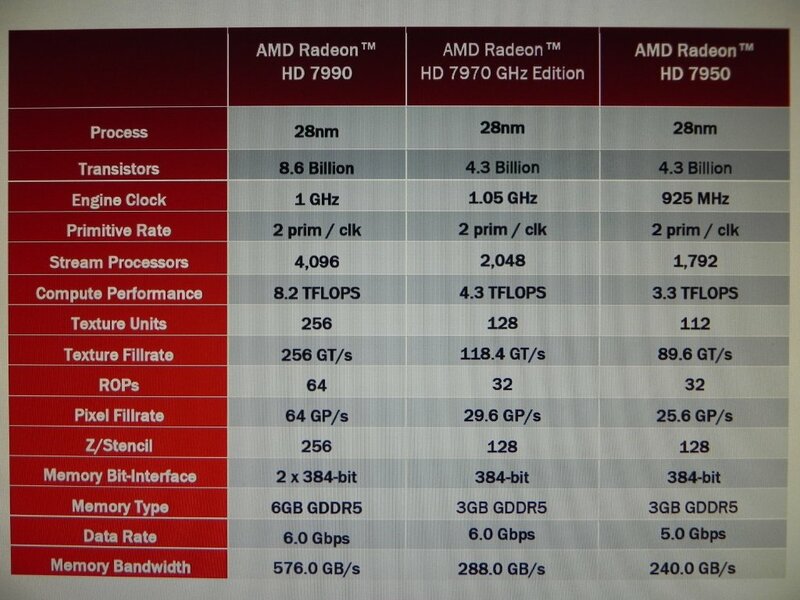 The Radeon 7990 has a peak compute performance of 8.2 TFlops. 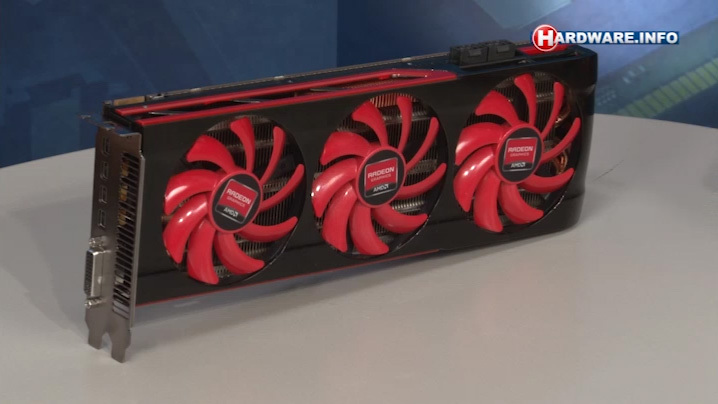 AMD’s Radeon HD 7990 is assembled using a dual-slot cooling solution which features triple fans etched on the shroud. These 92mm fans are part of the turbine cooling design which provides enhanced cooling performance to the internal vapor chamber heatsinks equipped on each core and fused together using copper heatpipes. Although these results were taken from a synthetic performance, the real battle would begin when both the flagship Dual chip GPUs – Radeon HD 7990 and the GeForce GTX 690 get pitted in actual gaming titles. That would go off to show whether the new GPU delivers better scaling performance compared to AIB custom parts that were released last year. 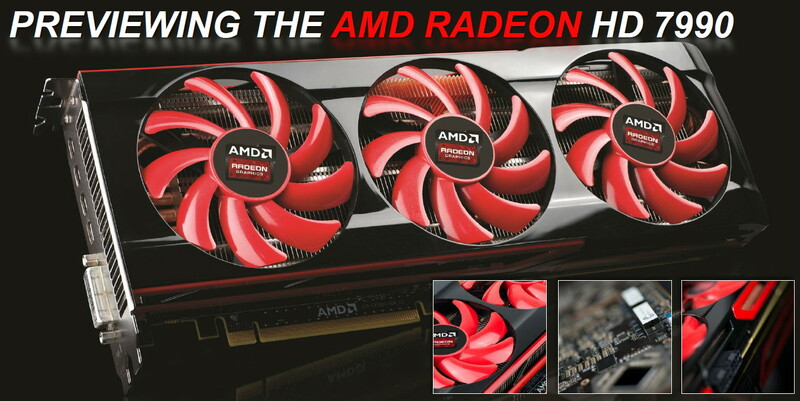 The reviews of AMD’s Radeon HD 7990 “Malta” GPU would go live on 24th April 2013. 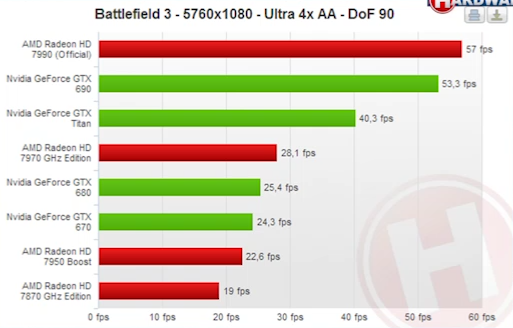 Update: Hardware.Info also seem to have given a glimpse of the Radeon HD 7990’s performance in Battlefield 3 at 5760 x 1080 resolution in Ultra quality. 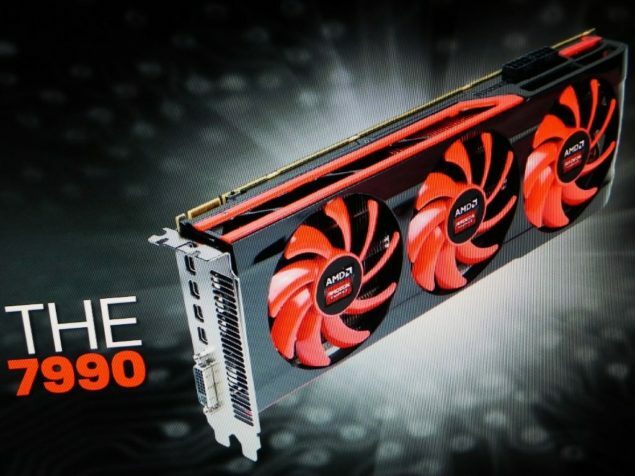 The results show that the Radeon HD 7990 is a few FPS faster than its competitor aka NVIDIA GeForce GTX 690.